Office Profile has worked closely with Techspace on a number of projects including Techspace Luke Street, Techspace Berlin and Techspace Leman Street. 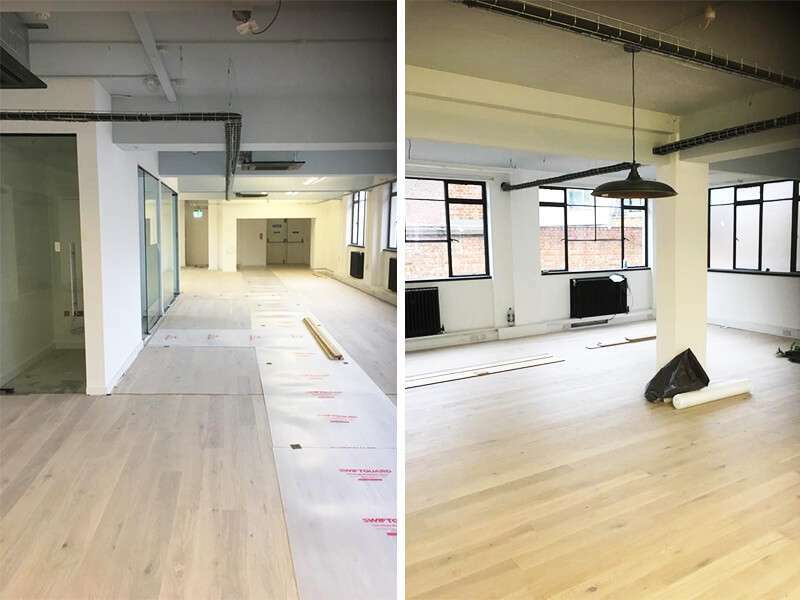 They approached us once again to complete the strip out and refurbishment for their new co-working space in Scrutton Street, London. We started onsite on 3rd December last year and are on-track to complete the project by the end of January 2019. We have replaced the existing vinyl floor tiles with durable wooden flooring throughout the main office space, and carpet in other areas such as the meeting rooms. The client wanted to keep some of the partitioning which was already in situ so we have reconfigured them with new bulk heads. New sleek glass doors have been fitted for each of the meeting rooms and for the new phone booths we have built – there are two booths on each floor. There is a teapoint on each floor with a breakfast bar and herringbone tiling. In the washrooms, we have replaced the existing flooring with contemporary grey vinyl, installed new cubicle panels and new hand dryers. We are very much looking forward to seeing what Techspace Scrutton Street will look like once it’s finished. Keep checking back for the case study and the full photo gallery!